I don't really think you can beat the price. I'm sensitive to chemicals and noticed nothing with this. The fact it has real springs probably helps with that as well. Very comfy, feels like I'm sleeping on a cloud. I can't wait to go to sleep on the thing. The only thing that's not really a problem is I think I don't need as much sleep. Still not sure but it feels that way so far. 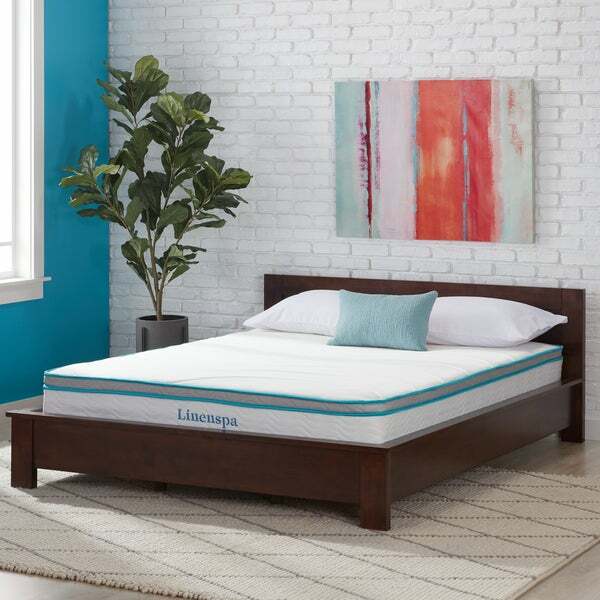 Mixing the necessary support of a traditional innerspring mattress with the comfort of memory foam, the LINENSPA queen-size mattress is the perfect bedding solution. While the innerspring offers full support, the memory foam redistributes body weight and heat, making for an ideal night's rest. This product comes vacuum packed and rolled in a portable box for customer convenience. You can sleep on it the same night you unwrap it, however please allow 3 days for mattress to rebound to full height. I can't understand why anyone would give this less than a 5 star review? The company is awesome, the mattress arrived 2 days after I placed the order and was in perfect condition! The product description clearly states the dimensions and also clearly states that it is medium-firm. The mattress was incredibly easy to handle and came rolled up in a box. Opening the mattress was easy and took less than 5 minutes until I had it on the bed frame. I cannot speak to longevity as I have only had it for a week, but for a queen sized mattress for less than $200 dollars, there is nothing to complain about! Within a few hours the mattress was puffed up to its full 8" advertised height, and is the most comfortable mattress I've ever laid on. The memory foam topper makes the mattress soft, but the springs underneath provide excellent support. The springs are unnoticeable, and cannot be felt at all. The mattress is also very quiet and has no squeaking or spring sound. Prior to this mattress, I would wake up multiple times a night and adjust position and would always wake up in the morning with a headache, back pain and neck pain. Thanks to this mattress, those issues are a thing of the passed! the mattress came in a box but once it opened fully i have slept so much better! I would definitely recommend this product to anyone who asks! It’s a good bed and it expanded completely within a couple of hours and there was no odor. The only thing I don’t like and this is just personal preference, is that is too firm for my taste so after sleeping on it a few times, I added a 2 inch memory foam topper and now it is perfect. It is in my guest room and I am happy to have a comfortable place for friends and family who visit. I thought this would be just a piece of foam, but I got it because it won't be used everyday. It came in a vacuum packed roll, but when I opened it, it turned into a queen sized mattress with pillow top, innersprings, the whole works. The grandchildren say it is very comfortable, and that's good enough for me. I am a curvier person who prefers to sleep on their side. This mattress is soft enough to hug me, but not sink me in too deep. The top is so soft, it feels great even through sheets. It expanded quickly and to its full height. No bad smell that I noticed. I was skeptical of ordering a mattress that would come by mail. The mattress was a great purchase. It came in a long rectangular box. When it arrived, I was sure there was no way a queen-sized mattress could be in the box. Once I opened the box, the mattress unfolded and there was my queen sized mattress. It is soft. The actual top of the mattress is soft. It is supportive to my back and sinks in just the right amount for me. It is not firm so if you like a firm mattress, this may not be the mattress for you. I love my new queen mattress. It is increasingly difficult to find a mattress which isn't all foam, so I was interested in this item for my adult son. The mattress came extremely quickly, in good packaged condition, and easy to unwrap and set up. It has the springiness of a traditional mattress, but it well-covered by a nice memory foam layer to keep it comfy. The mattress seems about medium firmness, and provides a good night's sleep at an excellent price point! A heckuva bargain for the price. Very comfortable sleeper. Does what it says on the tin. The memory foam layer disperses the heat well -- a rather critical luxury feature for those of us living in the desert. I'd buy it again if I get another bed. Surprisingly comfortable. I’ve had for 5 months & sleep deeply each night. I love to lay down in this mattress after a long day & straighten out my spine, feels good. Mattress comes rolled in a very heavy box. Be sure to open box in the room where you want to place it on your bed frame. It will be in a vacuum rolled bag & once opened, the mattress will inflate in a few minutes. It’s advised in the directions that it will take 24hrs to fully open, but I slept on it 2 hrs after opening & it was comfortable. You don’t need a box spring with this mattress, can use directly on a platform frame. I’m impressed by this mattress. I purchased it for under $150 with my bonus points. I think it equals a mattress for around $500, & was delivered to my home for free! Very comfortable and supportive, was concerned that a mattress of this width would not provide sufficient support but this one is quite nice! Simply a great value! Bought two of these for my boys. Very comfortable! Would buy again! Shows up in a box. Ended up being a great purchase for us. The only thing I wish was that it was organic cotton. I have to admit I was skeptical about ordering a mattress online. But what pleasant surprise. Its sleek and comfortable. I highly recommend it. Speedy delivery time. Very easy fast opening of box and plastic. Mattress is firm, works very well on platform bed in my small guest room. I use this mattress in my guest room. It gets used quite frequently and the reviews are all the same: very comfortable bed! It was a small investment, but apparently a good one! Delivered in box. Soft. Great quality for small money.Great quality and design. Very comfortable! Highly recommended! Nice color with great details. Very easy to put together! When I ordered this my expectations for this item were not that high. When I received it I was amazed. The comfort and the durability of the product is amazing and very nice. This mattress is SOOO comfortable! It provides great support, and did not trap heat like other memory foam mattresses I have owned. Absorbs motion well, too! Was not up to the standard expected. Nice frame cover was impossible to put on ended up ripping zipper. This was my first purchase of a mattress in a box so I was a tad skeptical but let me tell you, I absolutely love it! I was able to put it on my bed frame which is extremely tall on my own and it inflated in less than a minute. I would purchase another just to watch it pop up out of the vacuum seal wrapping lol. We have slept on it for about a week now and it truly is the softest mattress. It seems to be a very well built mattress that will last a long time. Super pleased with this product!! This a great mattress at a great price.. I had a 6000 mattress that I didn’t sleep as well as I do on this one. It is a great value and I highly recommend! bought it for our guess room. and the firts night we received it my husband spend the night on it. he said he sleep go goos on it the mininute he laid down to sleep it knocked him down. he has issues with his back and he said the mattress help him relax at least for that night. Great, cheap mail-in-order mattress. Been using it for about 3 months and have had absolutely no issues. I tend to have back pain, and wake up feeling great. It's the perfect middle ground of soft/firmness and is super soft. "How heavy is this mattress once fully opened?" This mattress weighs around 67LBS. Its pretty awkward and not too bad but as long as your just putting sheets on and off no issues. "How many coils are in this mattress?" That coil count would vary on the size of the mattress. "Does this mattress require use with a box spring?" No, this does not require a box spring. 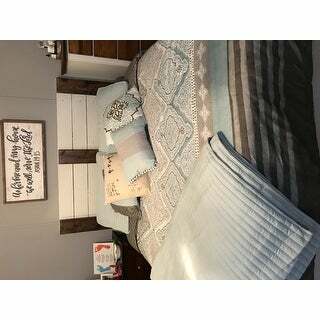 "I want to buy this mattress but can't find the headboard and frame included in the picture! I want to order that too! Please help!" 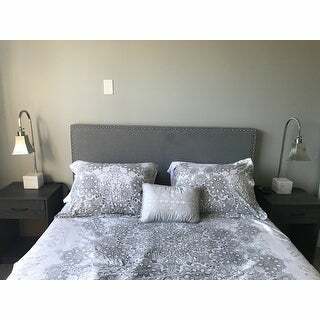 "Will this mattress go with the DHP finial bombay metal bed? Will I need a box spring to go with this?" My 2 teens says it sleeps well. However, I have one on a box spring and the other is on top of a 2nd mattress. It may not be necessary but it makes it better. I think for an adult (I am 250 lbs with back issues), it would not sleep well without a box spring. The mattress was a lot cheaper when I bought it. "What kind of coils does this mattress have?Are they pocketed, continuous, or bonnell?" "does the product comes with a box spring or is it saying the bed had spring coils in It? " This is just the mattress.The box spring is not included. We bought it without the box spring and it works fine! Of course you can use a box spring with it!